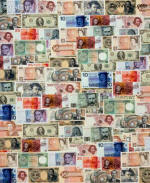 Funny, interesting, thought provoking images of money, dollars, currency and moola. 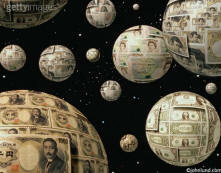 Money coming out of faucets, being thrown in the air, squeezing through an hourglass, covering a planet, as jigsaw puzzles and serving as a flying carpet. I’ve photographed a ton of money over the last thirty years. I have photographed money coming out of faucets, being thrown in the air, squeezing through an hourglass, covering a planet, as jigsaw puzzles and serving as a flying carpet. I have Photoshoped money trees and coins exploding out of piggy banks. 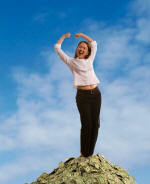 I have made pictures of money being stretched, filling shopping carts and being raked into piles. 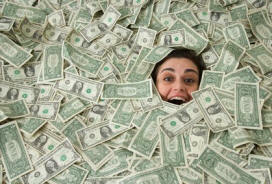 I have pictures of money on trees, pictures of piles of money and pictures of stacks of money. I have pictures of money from around the world including, English pounds, Italian Lira, Japanese yen, German marks and, of course, Euros. 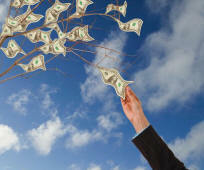 Heck, I have even created an animated stock footage clip of “raining money”! 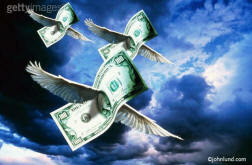 The first stock photo I ever created using Photoshop was a picture of money…flying through the sky on egret wings. As a matter of fact, seventeen years after I created that stock photo it was used on the cover of Time magazine! It took me two days and ton of work to create the flying dollars. I was using Photoshop 1.0 on a Mac II computer. Just rotating a 30megabyte file took 40 minutes! I could do that image now in an hour at most. Back then I had to have a color separator scan the files and that cost $80.00 per file. I had photographed Snowy Egrets in the wetlands of Marin for brochure advertising a new housing development. I photographed a hundred dollar bill and had that, and a stormy sky, scanned as well. 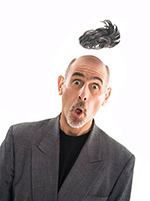 Back then I had no clue about clipping paths, if Photoshop even had clipping paths back then. There was only one level of undo and no layers at all. Selecting the dollar was done with the lasso tool and cleaning up the selection seemed to take forever. A number of people told me that professional work could not be done with Photoshop, and even more told me I was getting into it too soon. But here we are 18 years later; the image is still selling, and, as I pointed out, even ended up on the cover of Time! Authority: 18 UNITED STATES CODE; 504: Treasury Directive Number 15-56 FR 48539 (September 15,1993) 411.1 Color illustrations authorized. 3. All negatives, plates, digitized storage medium, graphic files, magnetic medium, optical storage devices, and any other thing used in the making of the illustration that contain an image of the illustration or any part thereof shall be destroyed and or deleted or erased after their final use in accordance with this section. Having said that, I never have paid attention to the rules…I have just shot what I wanted (hope I don’t write my next article from a cell). Maybe these are rules that the people who reproduce the images have to worry about more. 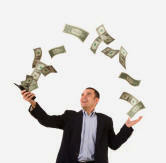 When shooting dollars it is a good idea to phone ahead to the bank to make sure that have enough clean new bills. More than once I have shown up at a major bank only to find that they didn’t have enough fresh bills for my photography needs. Now I always phone ahead. Banks have certain days on which there new bills are delivered. 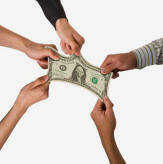 It can take more money that one might think to capture great concept pictures of dollars. To shoot a shopping cart full of money I first filled the cart with crumpled paper, and then spread a thin layer of one-dollar bills over and around the “filling”. It took every one of my 2,500 one-dollar bills! Even then there will still some small gaps that I had to fill with Photoshop.